Usually, product shipped will have 5 to 8-month expiration date. Drink Pro EM•1 Probiotic for good digestion, for a healthier colon, and for some, less flatulence! This is the first probiotic containing phototrophic bacteria which are known to break down toxins and produce antioxidants! Why do many of us have unhappy colons? Well, with the extensive use of chlorine in drinking water, and environmental toxins, in general, there is a negative and harmful effect on intestinal bacteria -- those microscopic critters we rely on to help us digest and break down what we eat into nutrients our bodies can absorb. Antibiotics are also a big factor since they are designed to kill bacteria. The problem is that antibiotics not only kill the bad bacteria, but also kill the good ones that help keep us nourished and healthy. Antibiotics don't make a distinction between the good guys and bad guys, and therefore, too many a times, contribute to some bad side effects, such as issues in the colon. Even if you drink bottled water instead of tap water, eat healthier and/or organic foods, and seek alternative medicines to avoid such medicines as antibiotics, it's impossible to control the bacteria you have. Don't Worry, There's A Way! The best way to control the bacteria you have is to drink Pro EM•1 Priobiotic! phototrophic bacteria - known to break down toxins; produces antioxidants, such as, vitamin A and carotene which are good for healthy skin, bones, as well as good for night vision. lactic acid bacteria - known to reduce the harmful bacteria; helps to improve digestion; studies have shown its ability to stop H. pylori which is associated with stomach ailments and ulcers. yeast (also known as brewer's yeast) -- known as a source of B-complex vitamins, protein, and chromium. The ingredients are organic aloe vera gel, natural honey, organic molasses, purifited water, Lactobacillus plantarum, Lactobacillus casei, Lactobacillus fermentum, Lactobacillus bulgaricus, Saccharomyces cerevisiae, and Rhodopseudomonas palustris. 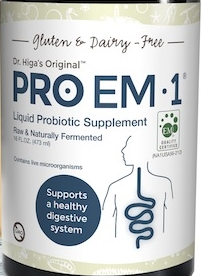 Pro EM•1 Probiotic comes in a 16 oz bottle with a suggested daily use of 3 teaspoons with or without meals, one bottle should last about one month. Get a happy colon now! Or don't wait until you get an unhappy colon! PRO EM•1 for digestive care, constipation, diarrhea, heartburn, improve vitamin absorption. * This product has not been reviewed by the FDA and is not intended to treat or cure any health condition. As with all dietary supplements, please consult with your physician or a health care practitioner before using. The user takes full responsibility for using this product.